Nanny: How wonderful for your little ones to spend quality time together as siblings! 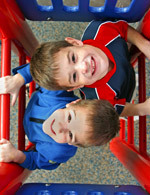 Your Delaware Nanny will present group activities that your children can do together. With all that time learning and playing together at home, your children are sure to form the strongest sibling relationships with one another! 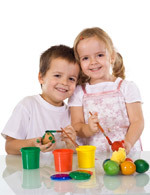 Daycare: Without a doubt, when sending your children to daycare, they will not all end up in the same classroom. And for good reason; naturally, with the amount of children in the center, daycares need to separate the children by age. Even if you have twins or multiple children of the same age, more than likely they will be separated to make it easier on the teacher. Nanny: No one knows your child better than you do, so of course you'll know what activities your child will love best! The schedule and activities that you request are entirely in your control. Just think, your child will be potty training, perfecting his ABC's, or perhaps learning a different language, all according to a schedule that you can set! Nothing is more rewarding than watching your child grow and succeed every day! Daycare: All too often, when you pick your child up at daycare, teachers are too busy to give you a play-by-play on what your child achieved during the day. At best, you will receive a letter at the end of the week with the list of activities that have been completed. This type of interaction is far less personal than what a Nanny is able to offer. Nanny: Your children can certainly spend plenty of time getting fresh air with your Delaware ABC Nanny if you would like them to play outdoors. After all, sunshine can make anyone happy, especially children! Having a Nanny can allow for every day to be filled with nurture and plenty of nature! Daycare: How difficult it must be for a daycare teacher to monitor a group of 20 to 25 children outside! For this very reason, and to assure safety of the children, outside play is extremely limited in daycare centers. Nanny: Your Delaware Nanny will make sure that your child is getting the individualized attention that he or she needs and wants! Your Nanny will interact with your child one-on-one and focus on all of your child's interests. You can be confident that your child will be receiving the best care from a local professional, while participating in activities that are sure to enrich your his or her life! Daycare: It is not professional to show favoritism among students, therefore, each child receives the same amount of attention at daycares. In a classroom with a high student to teacher ratio, the amount of time given to each child is extremely limited. Nanny: As a working parent, it is difficult not knowing how your child's day is until the evening. Often times, you may notice it is a beautiful, sunny day outside and wonder if your child is enjoying it. 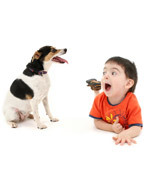 When you hire a Delaware ABC Nanny, you can be notified of your child's day whenever you want! Call your child, and see if he or she has played outside today, or hear about how your child's day is going whenever you want! Just hearing the joy in your child's voice is sure to put a smile on your face and make your work day a little less stressful! Daycare: Because daycares need to provide a structured environment for classrooms full of students, they are often averse to parents frequently calling for reports on their children. 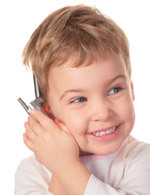 Even if the daycare does allow for parents to call, it would be a rare occurrence for you to speak directly to your child. To keep order in the classroom, you may only be able to talk with either a teacher or a teacher's aide to learn how your child is doing that day. Nanny: No matter the age of your child, a Delaware ABC Nanny is sure to provide homework assistance! Our Nannies are highly qualified childcare professionals, many of whom have a background in education. Your Delaware ABC Nanny will be able to meet your child's individual needs, and work with him or her one-on-one to provide assistance on a difficult topic, or even help to advance academically! You can be sure that when you come home from work, you will be able to spend quality time with your child stress-free. Your Nanny will have already organized the after school assignments, such as transportation to and from after-school activities! Daycare: Daycares are great for providing social time after school. However, with the amount of children running around and playing, it is evident that not much can be accomplished academically. Your children may have been exposed to educational games, but a majority of the time, homework still needs to be done, and after running around for a couple of hours after school with friends, your children will most likely be extremely hyper or exhausted by the time they see you. Quality time with your children becomes limited when most of it is spent doing homework! Nanny: Your Delaware ABC Nanny is sure to promote a safe and worry-free vacation for you and your family! Just think of how relaxing it will be at the shore when you and your spouse walk hand in hand on the sand, knowing that your children are safe and sound. Your Delaware ABC Nanny will make sure that you get the soothing vacation you deserve! Daycare: How can you have a relaxing vacation knowing that you are paying for a service that is not provided? Even if your child is not at the daycare center, you still need to "hold your spot" at the daycare while you are away. In addition to this, you are responsible for providing any childcare you may need while away. Nanny: It is so difficult to leave your child on a day when he or she is not feeling well. You are torn between wanting your child to be comfortable and needing to go to work. 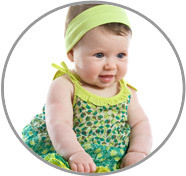 Delaware ABC Nannies are there at your child's side when you can't be! You will have the opportunity to let your Nanny know what your child's ailments are, and she will be sure to tend to them appropriately. She will update you at your request to let you know how your child is feeling, so you will be constantly informed and comforted! Daycare: With so many children in one classroom, it is not surprising that so many become sick so quickly! 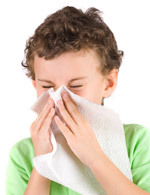 One child spreads germs to another so easily, that it is almost inevitable that you will receive a phone call at work requesting that you pick up your child. Or perhaps your child is so ill that he or she will not be able to go to school that day, subsequently you have no choice but to miss a day of work. Nanny: There's no place like home and at your home is exactly where your Delaware ABC Nanny will be, at whatever time is most convenient for you. Your Nanny works around your schedule, so you know she will be flexible, and prompt! The best part of having a Nanny come to your home is that you don't have to worry about packing diapers, food, favorite toys, bottles, or any other essential item your children would need throughout the day. Your Nanny comes to you! Daycare: Like any other business, daycares have certain hours of operation, leaving you with little flexibility. They also require you to bring certain items for your children, which can make your morning even more hectic by packing a bag, trying to get your children ready, all while keeping an eye on the clock to make sure you get to work on time.